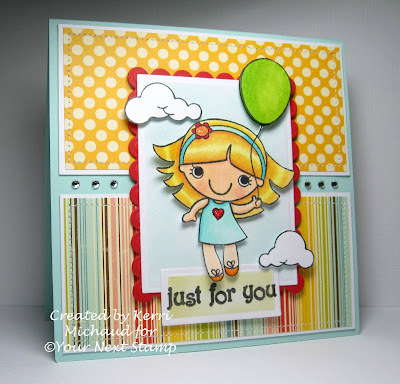 Your Next Stamp Challenge #15~Going Dotty! Top Pick – one lucky entry, chosen by Lana, will win $5 in YNS Stamp Bucks (to spend on YNS stamps) and the Top Pick Blinkie to proudly display on their blog! [NB You must use a YNS stamp on your creation to be eligible to win the Top Pick prize]. oooo...i love your dots!!!! I just got finished my color challenge...any chance I can please put it in? Fabulous Kerri! Love her blonde hair and how is she is floating in the the sky! You have been so busy since my last visit. Your cards and projects are stunning, as always. Aww! So cute!! Love your coloring of this sweet image and your take on the Sat. Sketch!! Congrats on winning the Royal Battle girl!!! This is so cheery and fun Kerri! She looks so happy flying through the sky on your card! Oh too cute!! I love this cute image, the pretty papers and your great coloring!! Wonderful! Kerri, your card is so adorable!! Love the way the scalloped red layer picks up on the touches of red in the image! Fun, summery colors! I LOVE this Kerri! She is UBER cute and your coloring ROCKS! FAB papers too!!! Summery and cute, I like how you highlight the hair on the girls... Nicely done. Love those cloud you cut out and the coloring on Fhiona is so sweet!! This whole card is super cute Kerri!! She's really cute...love those lil' popped-up clouds and the fun bits of bling in your dividing line fancy it up just a touch - fun colors too. So cute! Love the dimension and the papers you chose! Congrats on your big win!! You rock! These colors look so pretty with the Aqua Mist card base. I love it! And that balloon girl is always darling! 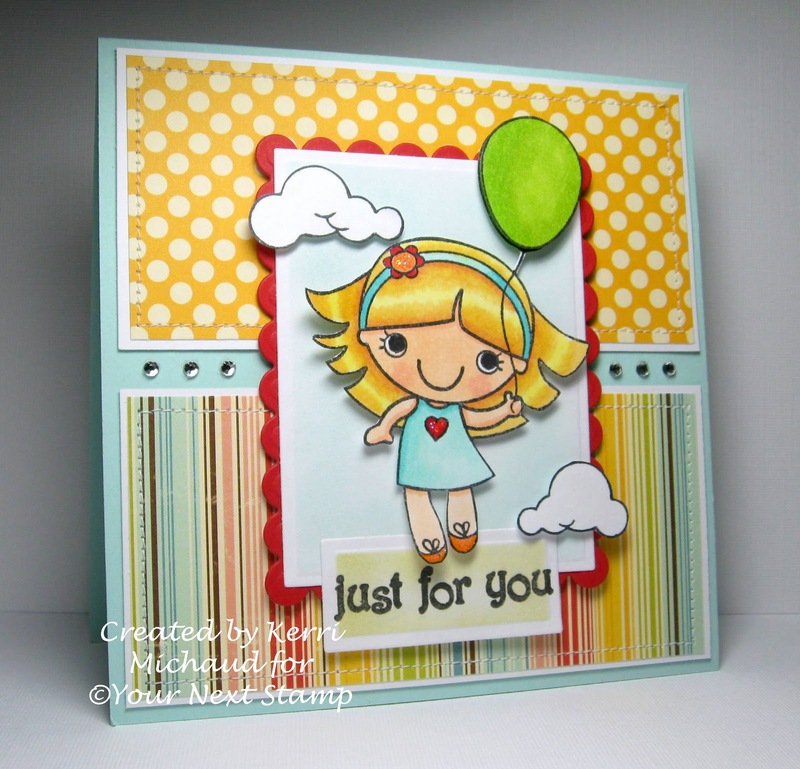 I am absolutely LOVING your colors and carefree feel to this card! Such a super fun creation!